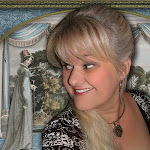 yesterday and stumbled on some intriguing items I just had to share. I love seeing old ornaments using them. which have now peeked my curiosity to learn more about them. One even sold for a whopping $1675.00 if you can believe that. 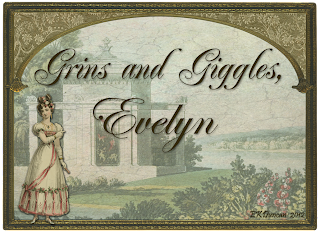 I hope you enjoy seeing these items as much as I enjoyed finding them. 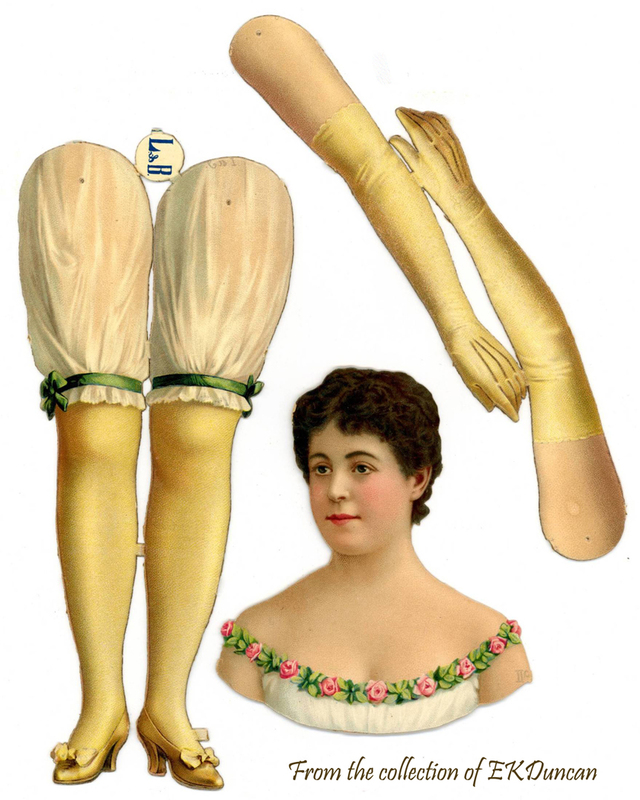 German L&B dolls and German scraps that are used to create this type of dressed doll. Well this one is an exceptional vintage creation that grabbed my attention. This sweetheart sold on eBay for $103.00 recently and is a fabulous example of what a bit of creativity and a few vintage items can produce. She is made from a vintage German scrap, vintage crepe paper (the heavy duty kind like Dennison made years ago) and some gold Dresden stars. recently created so I do believe the parts and assembly of her are indeed vintage. 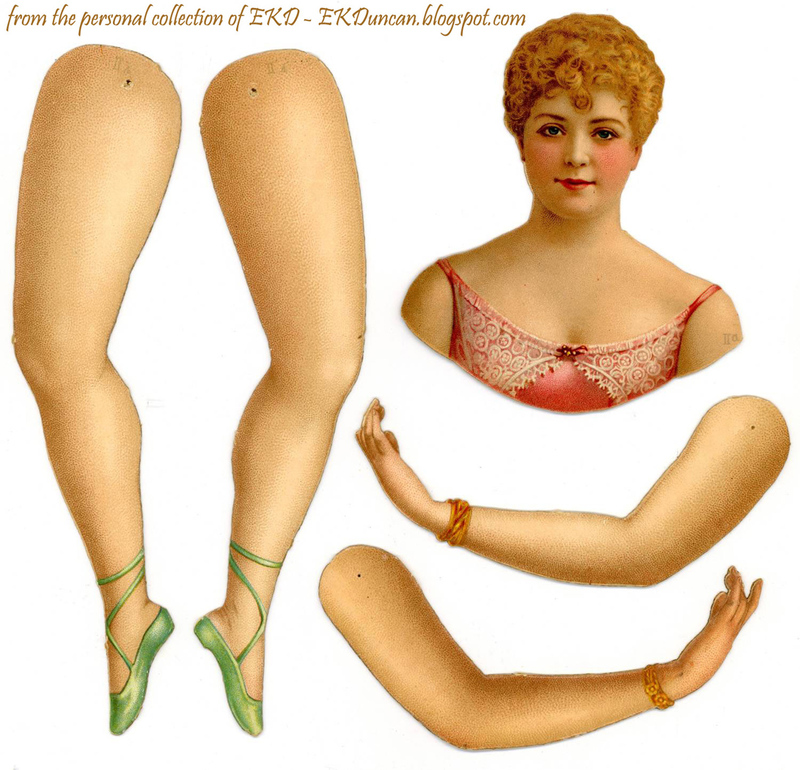 the very late 1800's and super early 1900's but the parts are still available today. So yes, you could create one of your vary own with a similar look if you choose. 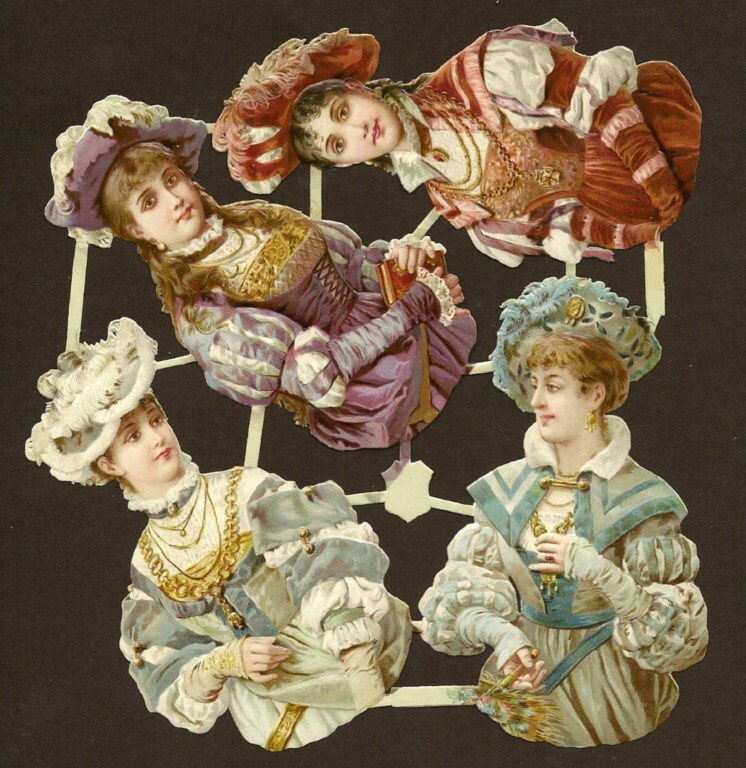 Sadly, I don't know who the maker of this sheet of Victorian ladies is but I thought you might like to see what an original sheet of fancy ladies looked like. The lady in the lower right corner is the same image that appears in the vintage ornament that sold on eBay recently. Just image a set of 4 such ladies on your tree. 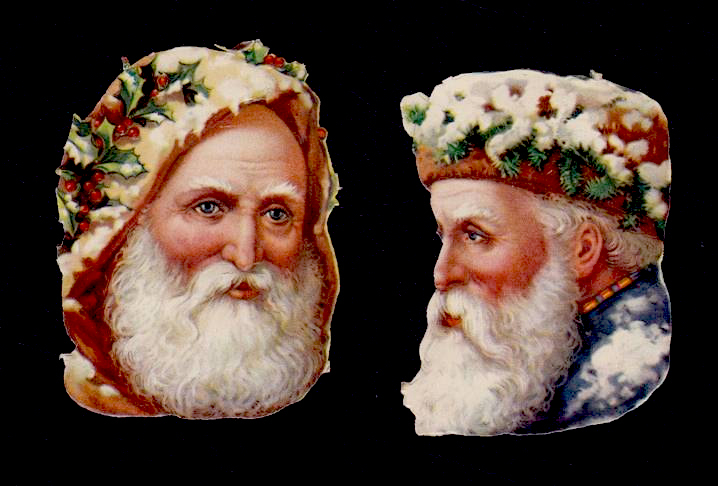 Victorian Scraps and Dresden Trim went hand in hand with many Victorian Christmas Ornaments. 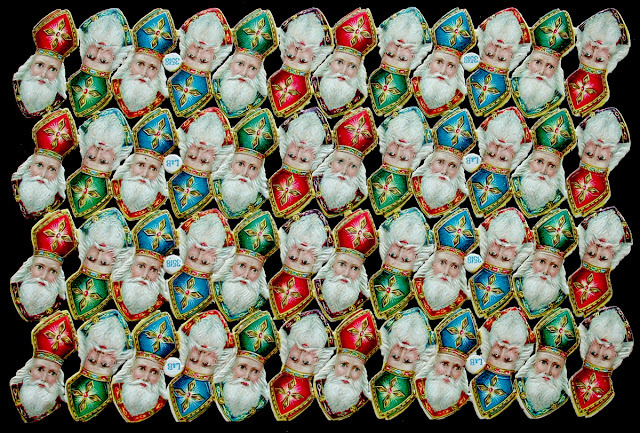 Some ornaments could be purchased already made or you could make your own unique combinations depending on how you matched up your paper products. 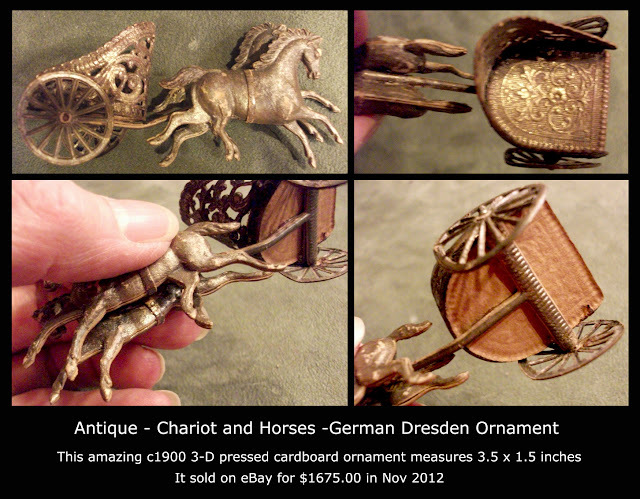 Here are a few examples of vintage created pieces using Dresden trims. or ornaments of a similar style come Russia. This set was probably Ukrainian in origin and have a very Russian Orthodox Church look to them. 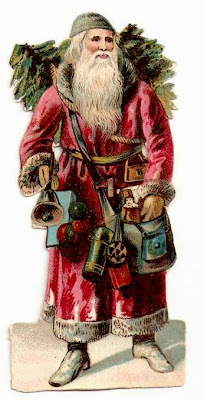 A similar set of Angels also sold around the same time. were probably made by the same individual. They were listed as vintage and do have the right look to be such. I love the aged patina that happens with old Dresden Trim, giving it that Old World feel. Many of the Dresden trims used on these angels are still being produced in Germany today and if you are lucky you can purchase old vintage trim if you hunt for it. ornaments that sold for a mini fortune (I've posed some of them farther down). A bit about Dresden Products. They are German made embossed, die-cut gilded cardboard or foil paper trims. or the lighter weight foil paper. It is still possible to find some new-old stock and those are a rare treat since they are heavier in weight than what is usually produced today. Many antique Dresden items have been handled repeatedly over the years, leaving them with a heavy patina or aged look; but I think that lends to their charm and are great on rustic looking Christmas trees or projects. themselves and their prices go through the roof when they appear on the open market. The new Dresden trims have the look of the old ones since they are many times made from the original plates back in Germany. They are affordable and readily available but they are slightly thinner and the foil process is not the same as was used 100+ years ago, so while a great substitute for crafters; they are not the same as vintage in look or feel - in my humble opinion. These two photos will let you compare vintage Dresden to their modern counterpart. Personally I find the new versions too lightweight to be used as ornaments on their own. Basically they are a pressed foil paper where the vintage ones are a sturdier stock. 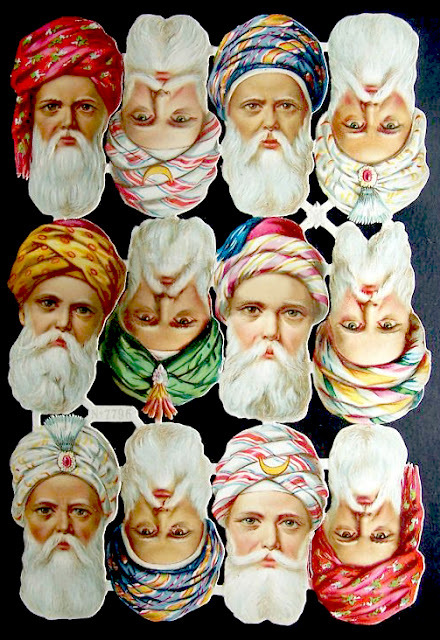 Modern Dresden trims are available from a variety of sources including sellers on eBay and Etsy. They come in a nice variety of metallic colors, shapes and sizes and add a great finishing touch to projects that have a Victorian look or that call for a bit of something "extra" to them. 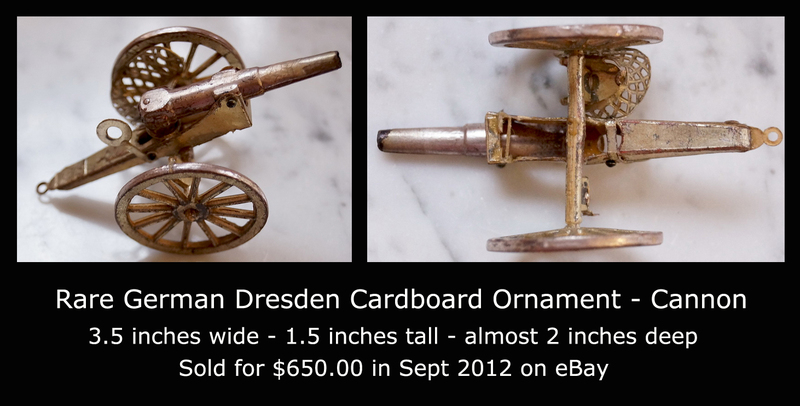 Many online suppliers also sell them - an Internet search for "Dresden Trim" will pull up several. 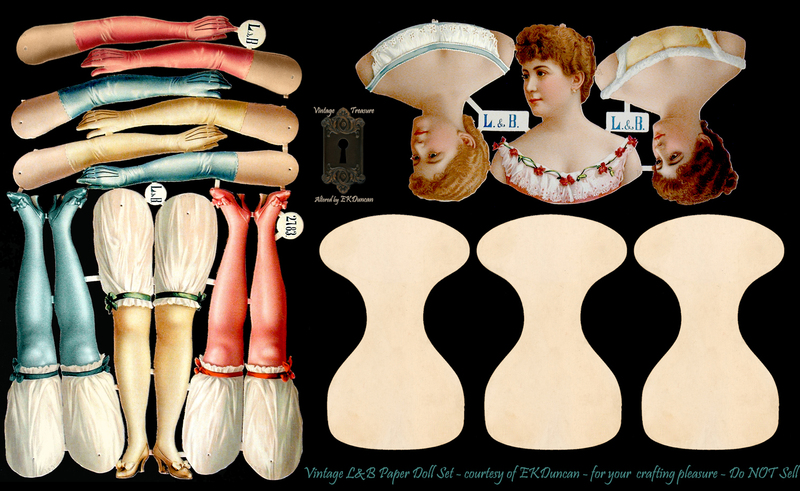 L&B articulated paper dolls as well as my budding interest in Dresden trims. with handmade costume that has been trimmed with Dresden stars. This vintage beauty has lots of Dresden trim. 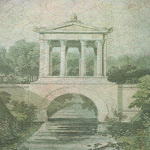 but the Dresden composition is stunning. Wings I can get but now I want to find the larger trims like was used in this skirt. It was probably a medallion or some such - the hunt is on! still being made Here are several that you can pick up readily on eBay. These wings are huge at 7.25 inches and would be great for a tree topping angel. According to the seller these are gold on both sides. The larger wings are 2 1/2 inches x 2 1/2 inches and the smaller wings are 1 1/2 inches. Dresden seller northwood0_8 on eBay has lots of examples for sale in a variety of color choices. I chose images from them since they were large and detailed so you could see how beautiful they are. most of which have worn off over time. Even missing the head but still managed to bring $106.00. I love the wings - they would be great on a Fairy Doll. The underside is nearly as impressive as the front. This Dresden Ornament is of Pressed cardboard and the embossing is raised on both the front and back sides of the wings. The body of the butterfly is 3-D and not flat and the wonderful condition of the piece is reflected in the bidding war that took place to win it. most of the time as you will see farther down in the post. The description states that they are pressed cardboard and that most of the gilding has worn off. I love the concept of using small "chromo" images with this type of Dresden frame. modern Dresden pieces to get a similar look to hang on my tree. Pressed Patriotic Dresden ornaments pulled in some nice totals as well. A Very Americana Ornament - Made in Germany but most likely for the American market. 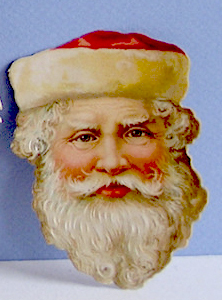 3 1/4 x 4 1/2 inches pressed paper Dresden Ornament in gold. I almost overlooked it in the preview window. 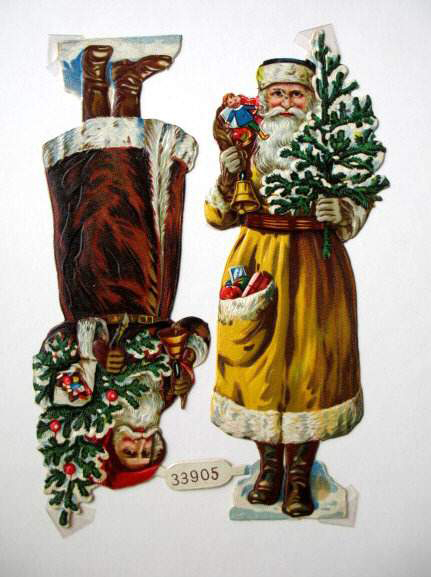 I'm sure there were various quality ornaments made depending on manufacturer and year produced as can be seen in the difference in the above parrot and the one listed below. This parrot is also of pressed cardboard and similar in style but he does not appear to be of the same quality or age of the fist parrot shown. He was acquired for $19.00 with shipping. of pressed cardboard and still has his wonderful color. After 7 bids it sold for $89.00 on eBay - Dec 21, 2012.
and stored in a similar manner for it to retain so much of its wonderful color. sold for $150.00 on Dec 21, 2012 - eBay. The same bidder that won the owl also got the baby, I'm so glad the two got to stay together. 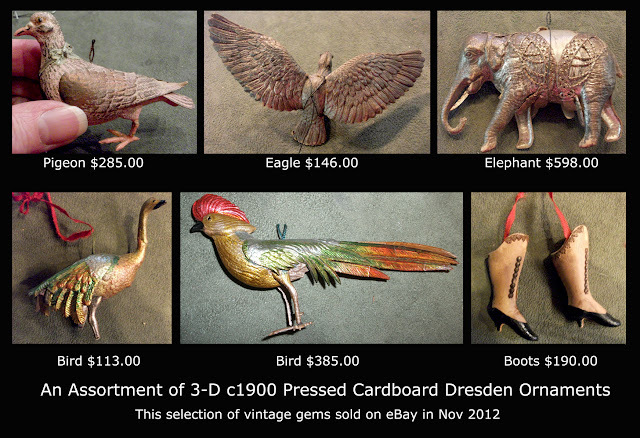 Now the really unusual Dresden styled cardboard ornaments that go for the real money seem to be 3 dimensional pressed cardboard ones like that $711.00 butterfly I showed farther up in the post. I guess over the years so many of them did not survive or were discarded and those that remain seem to be highly sought out by collectors. This is the first year that I've noticed them; however with the price tags these are getting; I know I'll be paying more attention to this type of collectible going forward. 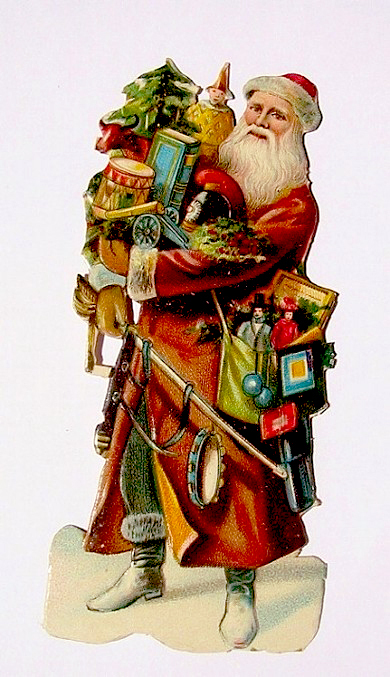 Check you closets and family's stash of ornaments ladies and gents - you may have a forgotten treasure stashed away. Here are a few of the rare beauties that sold in the last month or so on eBay. Animals seemed to have been one of the more popular choices in ornaments when these were originally made but my favorite are the boots - how cool! All these ornaments came from same collector and I find it interesting to see the amount of wear on the finish of some vs the finish of the others. The two birds on the bottom seen to have brighter color but it could be due to their "broken" condition that they were stored away and not put on the tree year after year as those from the top row may have been. It's no wonder these creatures come up missing a foot or wing as time passes. Just imagine, these are basically a heavy pressed paper and after 100+ years of being handled and packed year after year it's a wonder many of them survived through the years. I'm sure many a family tossed out those that got broken, crushed or lost their colorful coating from one year to the next but even in damaged condition the rare ones still brought in hundreds of dollars to the seller. Super rate or those in excellent condition were pushing into the thousand dollar mark or more. Two horsed and all the pieces intact - what a beauty! Two serious collectors pushed the price over the thousand dollar mark by auction end. 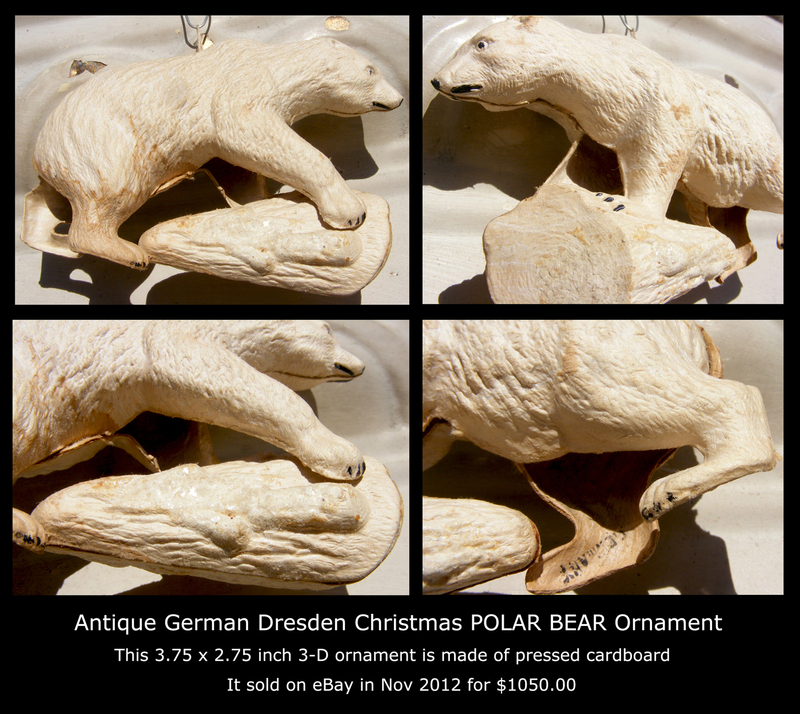 The seller had stated that after being in her family over a hundred years they were getting too fragile to be used on the tree anymore and rather than seeing them deteriorate any farther wanted to give true collectors a shot at them so they could be appreciated and preserved. and that it survived intact all these year - surprising. I'm intrigued at how he is "lashed" onto his cycle and that his vintage bindings are still there. There were a total of 31 bids amongst a handful of hopefuls. I can see how a collector would fork out $1307.00 to get him. I'm a big fan of c1900 German paper collectibles but when you see items like this ornament you truly understand the the beauty is in the details. I love how on the parts that don't "join up" as in the rear legs you get a sneak peek at the construction. You can see the thickness of the paper used and how amazing these pieces truly are. Each and everyone is a treasure for sure. Buy it Now of $1200.00 or Best Offer and it went for $1050.00. How about a Christmas Cannon? Yup, they made those too. It appears that Dresden pressed and shaped paper ornaments came in a wide variety of items to suite boys, girls and adults of all ages. I can just image a group of boys playing "war" with their Christmas cannons; which makes it all the more remarkable any of these survived to the present day. It only took one bidder willing to go the necessary mile to win this treasure. 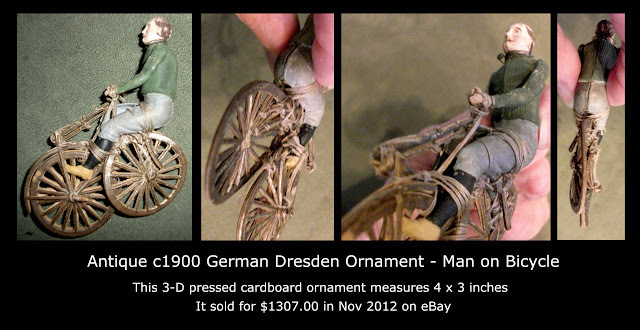 The German seller was asking a Buy it Now of $899.00 or Best Offer. I got a super kick on seeing this vintage find! but did not realize they came in shapes as seen with this vintage pistol. This is another miracle survivor into the present age. another and probably was packed away and forgotten for years. without an interesting story behind it's survival. The seller left it in it's present condition so buyers could see the internal parts on this piece. It's probably not often that one would get the opportunity to see the inside of a shaped "cracker" of this vintage and quality. 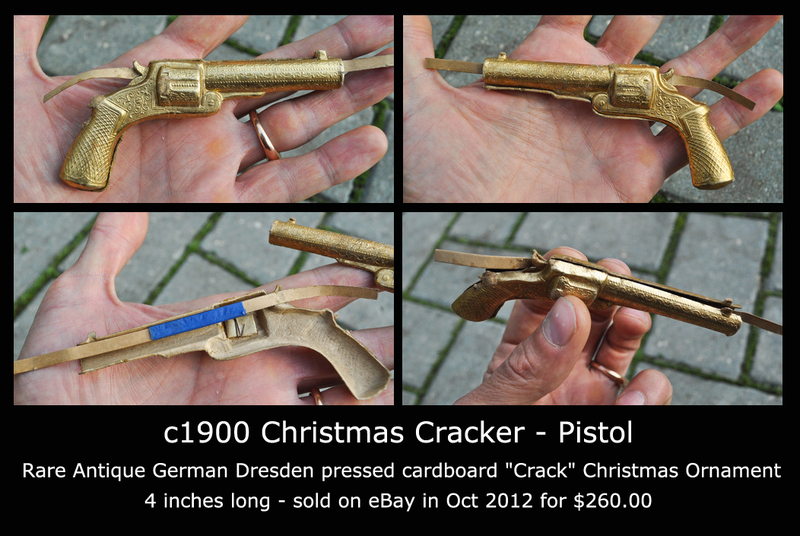 you find a Victorian Christmas cracker in the shape of a pistol? 6 bidder and 8 bids finally topped out at $260.00 for this treasure. This item was presented by a seller in Latvi. Well there you have it my fun vintage Dresden eBay Christmas finds for 2012. I hope it inspires you to dig through you attics to see if you have any surprises waiting for you. Lucky collectors with the extra cash picked up some spectacular example of these old world treasures; and we get the joy of seeing some treasures from the past that outside of a museum setting I'm not sure would have been seen in mass as these were. These were so much fun to see I think I'll continue to look for them thou-out the year. 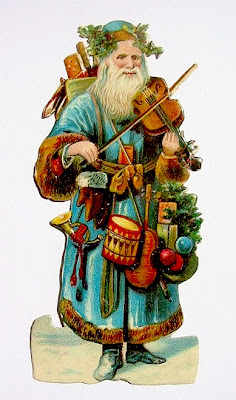 A Happy Christmas to you All!!! 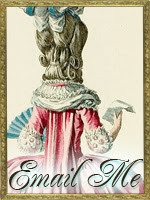 and thought I would post some fun vintage images I have in my archives. I have a tendency to save images for reference. 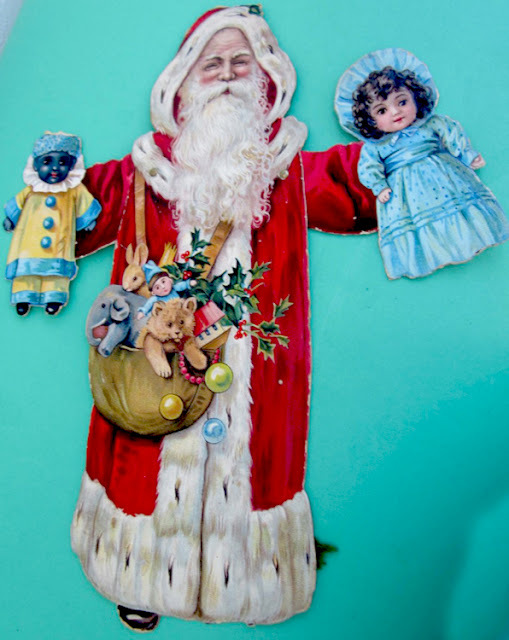 Today I'm posting some of my favorite Santa finds. 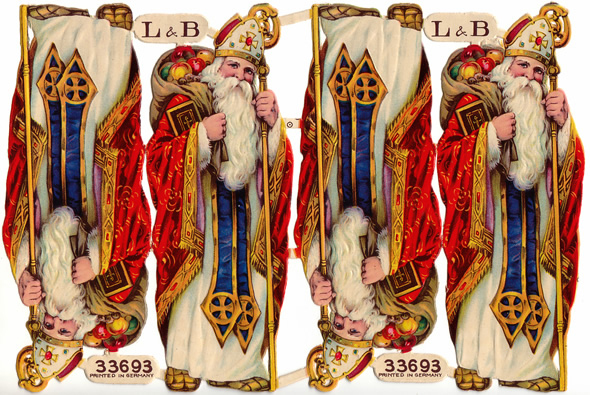 I collect L&B articulated paper dolls so in my hunt for those I run across great Christmas images by them on a regular basis. L&B (Littauer & Boysen) made a large assortment of Santa images from the 1880's through the early 1900's and these two extra large heads are among my favorites. 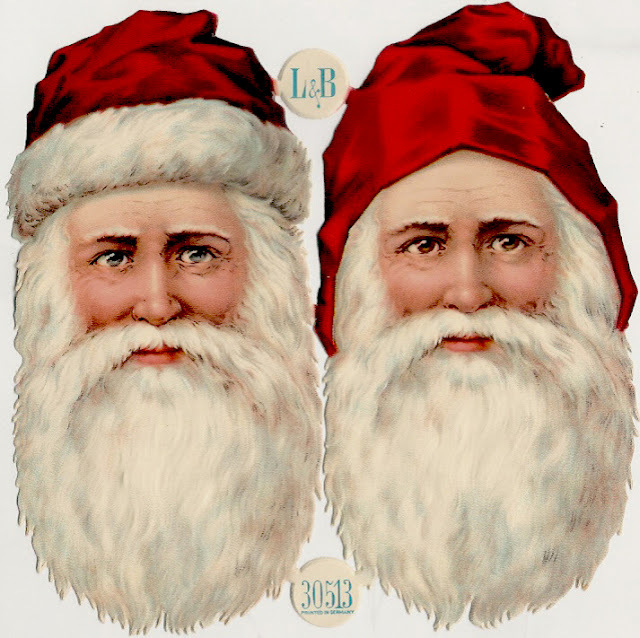 I think it's interesting to see a traditional and old world Santa together on the same sheet and I love that one has blue eyes and the other brown. are L&B but there are also a few other makers thrown in for some interest. similar to this one seen above. I believe this is a full sheet but am not positive. in the above example there is a traditional "red" Santa and then a fun one in blue. 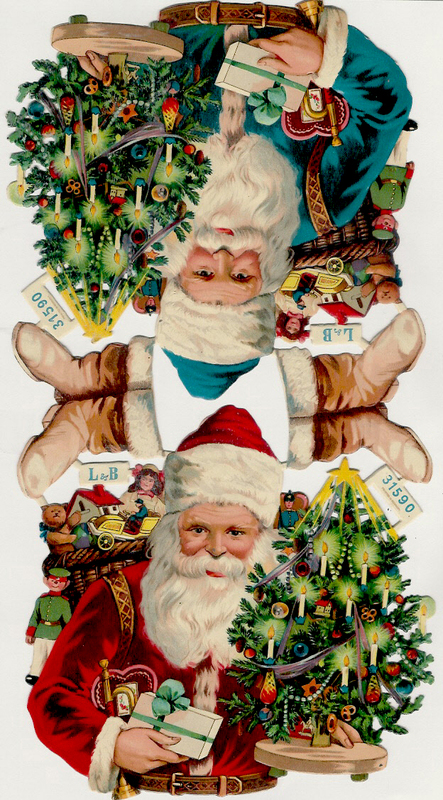 Two nice examples of Old Word Santas can be seen above. 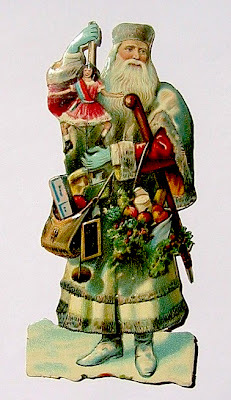 There are also a nice selection of Victorian St. Nicholas figures available on the antique market. There are also some interesting "Santa" finds if you look hard enough. 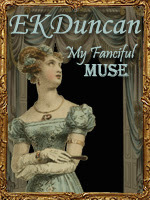 This one below has been on my "wish list" for a long time; so, I just spluged and bought it. 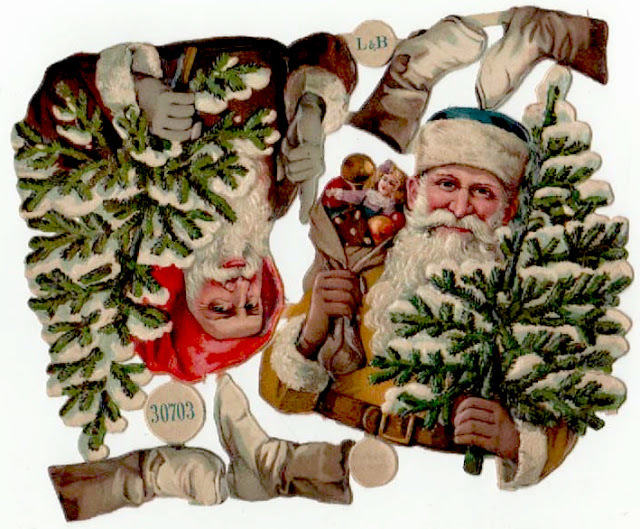 This A&M (Albrecht & Meister) sheet was made in Germany in the late 1800's or very early 1900's and with the seller also being in Germany it may not arrive till the New Year - but what a treat. 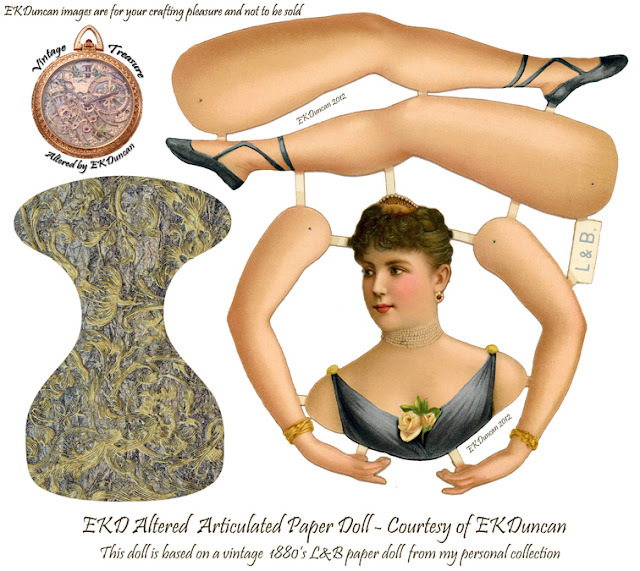 The Victorians had a sense of whimsy as can be seen in this sheet. 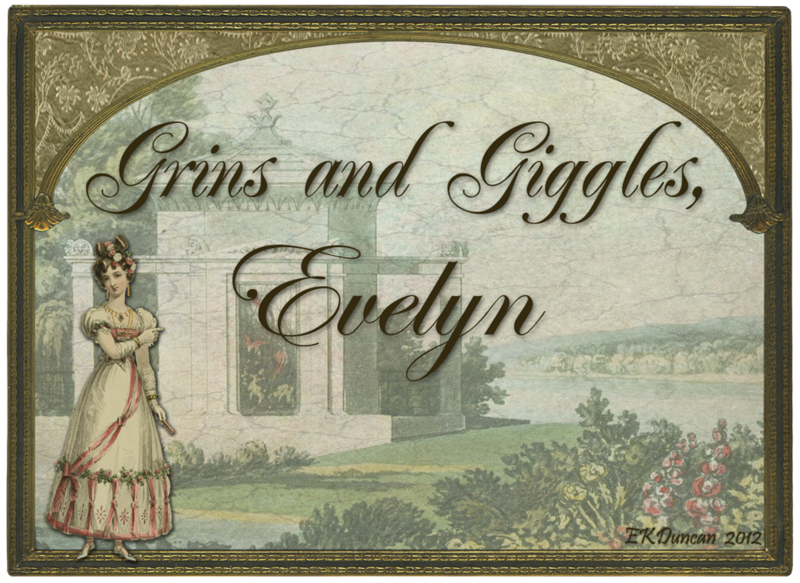 in that way just for the grins and giggles of it. This was an eBay find and his arms move. I just love his sweet, cheery face. the makers of these are currently unknown to me. 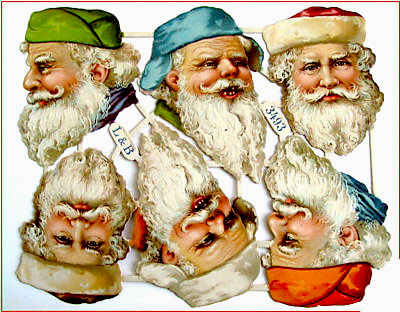 I adore Victorian Santas due the the variety of looks you can get them in. 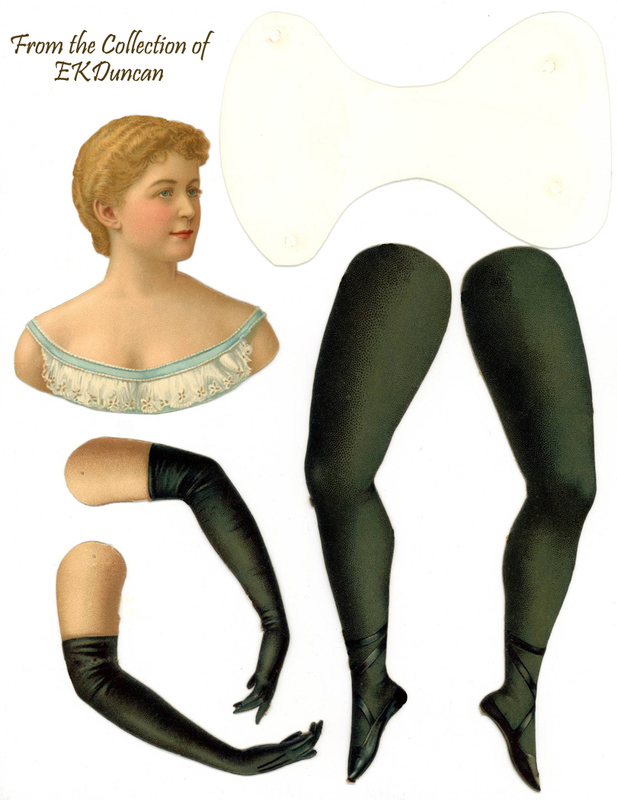 There is a wide selection of colors and styles, heads, full body and anywhere in between. the big bucks for a Victorian original. posted by nice folks who like to share. I hope this has inspired you to consider collecting or crafting with Victorian Santa images. Rubber Duck Nativity - Merry Christmas Fun!